I didn’t want Rage 2. I didn’t think anyone wanted Rage 2. I don’t, quite honestly, know why Bethesda decided to make a Rage 2. 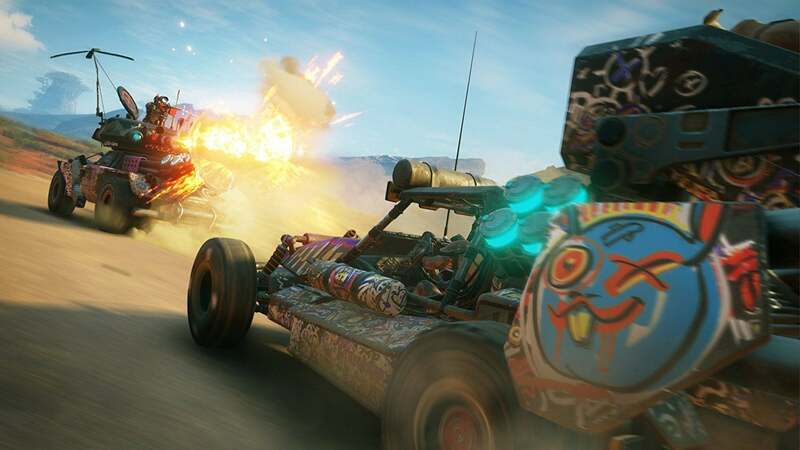 But after playing it for 20-odd minutes at E3 2018, I’m... kind of looking forward to Rage 2? 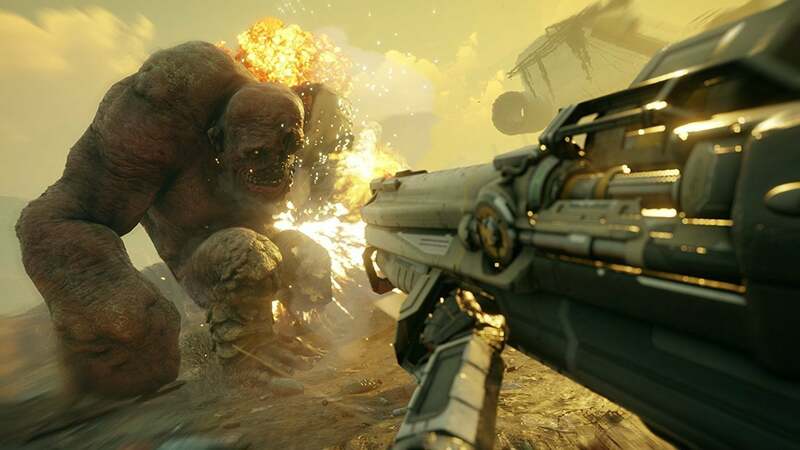 That’s the weirdest sentence I’ve ever written, but Rage 2 ($60 preorder on Amazon) is actually pretty damn good, mashing up Avalanche’s flair for cinematic destruction with id’s tight shooting from 2016’s Doom. It’s one hell of a combination. Not that we played much of it. As I said, only 20-odd minutes—not even an entire mission, judging by the video Bethesda showed us prior to our hands-on. The intro and outro of the mission were both lopped off in the interest of time, and we didn’t see any of the larger enemy types here. Just lots of grunts. It was a surprisingly flavorful demo though. We were dropped outside the Eden Space Center to start, given an assault rifle, a pistol, and a few powerful abilities, and then it was just guns blazing until the end. But it was guns blazing, mixed with some genuinely humorous dialogue. That’s what stood out to me most. The original Rage was a decent shooter, but even with the likes of John Goodman onboard I found the story stilted and tedious. Enough so that I don’t think I finished it. Rage 2 is much better, or at least this mission is. As I said, you’re tasked with infiltrating (read: killing everyone inside) the Eden Space Center, which is crawling with bandits. Upon encountering a locked door, the friendly-voice-in-your-ear hacks into the Eden Space Center’s systems to make sure the base’s defenses don’t turn on you. How? By making it think you’re the President of the United States. It’s outlandish, the type of silly joke I’d expect from Volition and Saints Row, not...well, Rage 2. There you are shooting your way through dozens of well-armed grunts and occasionally you’ll hear the base’s PA system chime on with a “Good day, Mr. President” or some such. The contrast is fantastic, and gives me high hopes for the writing this time. If this is Avalanche’s Mad Max game, but less dour and self-involved? Could be great. Not that we saw any of the Mad Max DNA in this E3 demo. That’s the driving and car combat side of things, and although we’ve seen some of it in Bethesda’s trailers it wasn’t on display at E3. Instead, Doom. The parallels were obvious even watching the Rage 2 trailer, and after playing it I can confirm: There’s a lot of Doom in this. It’s in the way shotguns roar and fling enemies back, the constant need to be on the move, all of it. You even have “Nanotrite” abilities, which encourage you to close the distance on enemies and fight up close. The simplest is a dash move, but there are also combat-oriented maneuvers that let you jump up and slam the ground, or blast enemies away from you. I assume there are more that weren’t shown in the demo, too. The system needs tuning, I think. All of these abilities are on a cooldown, and a lengthy one at that. 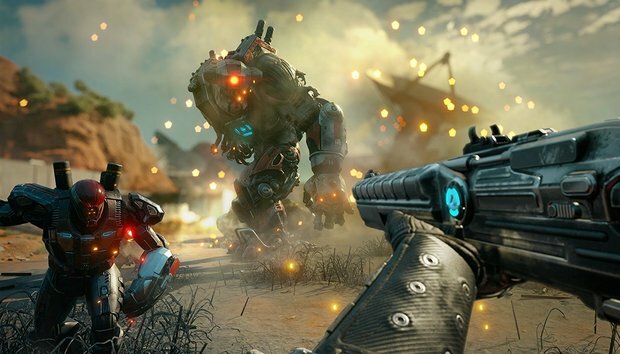 I understand wanting to give players a challenge of some sort, but Rage 2 has enough Doom in it that it feels torn between that and all-out power fantasy. Personally I’d rather Avalanche and id lean further towards the latter. I was especially annoyed the dash move is single-use, and then a two-second cooldown. Juuust long enough to be disruptive. Give me that sense of speed from Doom, or the constant strafing of Vanquish. That said, you can still wreck enemies. As I said, the shotgun is particularly powerful, blasting enemies backwards and stripping off bits of armor or even limbs. The assault rifle isn’t too bad either though, and even the pistol feels like it could do some real damage. 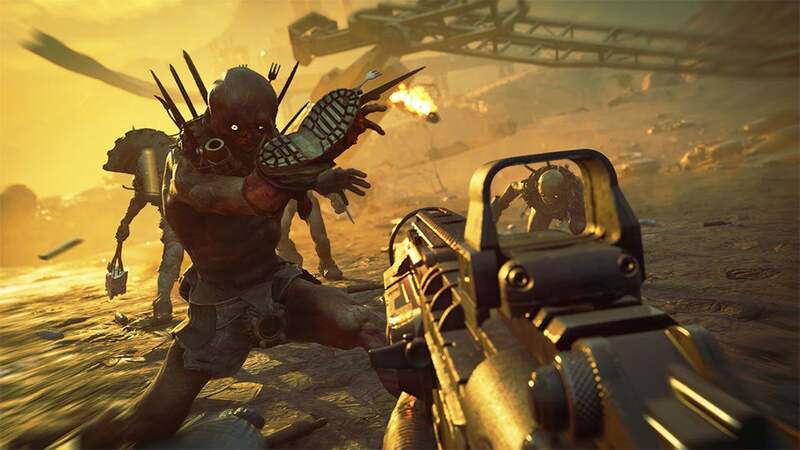 Rage 2 also packs that old-school feel, letting you carry an entire arsenal of weapons, an army’s worth of ammo, and a duffel bag worth of grenades. Returning Rage fans will also be happy to get their hands on the weird bladed boomerangs again, the Wingsticks. You can do a surprising amount of damage with those. There’s even an “Overkill” power you can trigger when you’ve built up enough meter, and it doesn’t just do more damage—it literally makes your bullets bigger. This is the stupidest feature I’ve ever heard described in a video game, and I mean that in the best way possible. It’s an impressive demo. I don’t know. I try to dispense with my own biases before going into any E3 presentation, but I really didn’t think we needed a Rage 2. I still don’t, the same way I didn’t think we needed another game called Prey. These are not hot, sought-after licenses, and why Bethesda feels like they hold any name cachet outside of some cult fans, I can’t fathom. Strip out the name though, remove those preconceptions, and Rage 2 seems excellent. Maybe not an all-time classic, maybe not “high art,” but certainly a fun-filled sandbox for gun fetishists. My only worry is whether it holds up over 20 to 30 hours. I had a great time with my 20-minute demo, but even Doom had become a bit stagnant by its later levels and it was probably half the length at most. It takes a lot of variety to keep up the sort of constant, grinding momentum in this Rage 2 demo, and I haven’t seen enough of the game to know yet. To summarize: Rage 2 is for people who do want to set the world on fire, and then light the ashes on fire afterward. It’s chaos. It’s nonstop guns, gore, and grenades, and it feels like it knows that. I’m still not convinced the world needed a Rage 2, but coming out of E3 I’m at least interested. Maybe this is the mashup I never knew I wanted, the Avalanche and id crossover album of the century. Bethesda’s surprised me multiple times now—with Prey, with Wolfenstein, with Doom, with The Evil Within II. I definitely won’t put it past them to surprise me again.